Atif Aslam Pakistani Pop Music Singer. He ha sung great songs such as Pakistani Pop Music, Filmi Music, Folk Music and he create great name in Pakistan Music. His mos most popular Artist of Pakistan and Bollywood. 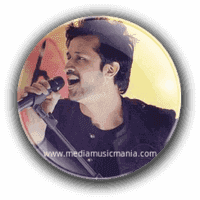 In the starting he decided to record from his own pocket oney and his first album released "Aadat" and Atif Aslam decided to continue his carrier as a solo Artist. After success of album Adat and he released his hit album was titled "Jalpari" with best song such as "Bheegi Yaadein", "Ehsaas", "Mahi Ve", and "Ankhon Say" and he came up with his own sound and this album was very popular in the youth of Pakistan. Atif Aslam started Music on Global Platform, he started his career as a playback Artist in Bollywood his popular song "Wo Lmahey" for "Film Zaher" and Indian audiences like his super hit song. I have selected below most popular Pop Music, Filmi Music of Atif Aslam. Atisf Aslam was born on 12th March, 1983 in Wazirabad, Pakistan, later he shifted to Lahore Pakistan and started his education. In the starting he played Cricket and later he set his mind to be a Pop Music Player on Band. He took part in many singing competitions in college and won lot of prizes. Atif Aslam first Pakistani Artist selected for Indian Film Fare awards two years in a row. Atif Aslam selected as a actor and took up the challenge to star in a movie called "Bol". Atif Aslam in short period of 07 years, now he is biggest superstar of Pakistan.